The author, (Sir) Arthur Conan-Doyle wrote his first Holmes story, A Study In Scarlet, in 1886. Sherlock Holmes, a fictitious character was based on a real man, Dr Joseph Bell, a renown forensic scientist at Edinburgh University whom Conan-Doyle studied under. Conan-Doyle wrote 56 self contained short stories & 4 novels (60 adventures in total) The collection is known as The Cannon. The first Sherlock Holmes film was produced in 1900. In 1939 the novels were developed as a series of films staring Basil Rathbone, establishing the trademark deerstalker, pipe & spyglass as a global visual icon. Conan Doyle wrote four novels and fifty-six short stories that feature Holmes. The first two stories, short novels appeared in Beeton’s Christmas Annual for 1887 and Lippincott’s Monthly Magazine in 1890, respectively.The character grew tremendously in popularity with the beginning of the first series of short stories in The Strand Magazine in 1891; further series of short stories and two serialised novels appeared until 1927. 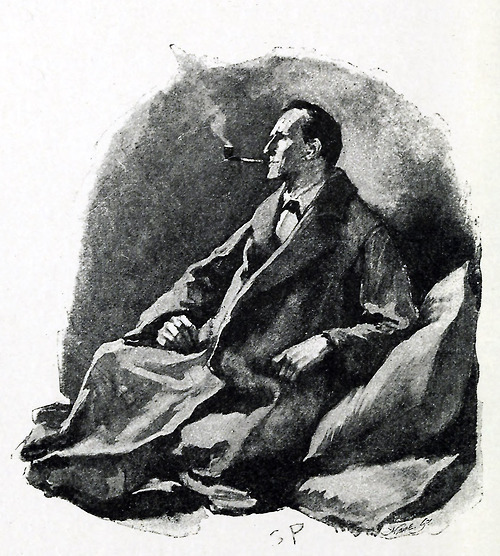 The stories cover a period from around 1878 up to 1907, with a final case in 1914.All but four stories are narrated by Holmes’s friend and biographer, Dr John H. Watson; two are narrated by Sherlock Holmes himself, and two others are written in the third person.Conan Doyle said that the character of Holmes was inspired by Dr Joseph Bell, for whom Doyle had worked as a clerk at the Edinburgh Royal Infirmary. Like Sherlock Holmes, Bell was noted for drawing large conclusions from the smallest observations. Michael Harrison has argued in a 1971 article in Ellery Queen’s Mystery Magazine that the character was inspired by Wendell Scherer a “consulting detective” in a murder case that allegedly received a great deal of newspaper attention in England in 1882. Perhaps one of the quirkiest twenty first-century homages to Holmes belongs to the award-winning American TV series House, which began transmitting in 2004, starring the British actor, Hugh Laurie. Now into his fifth season, Dr Gregory House is in many respects a medical Sherlock Holmes, and series creator, David Shore, has admitted that even Dr House name is meant as a subtle homage. The show draws heavily upon Holmes archetypes, such as House reliance on psychology to solve a case, his reluctance to accept cases he does not find interesting, his drug addiction (Vicodin instead of cocaine), his home address (apartment 221B), a complete disregard for social mores, personal talents (playing piano and guitar, rather like Holmes violin), as well as Holmes characteristic ability to judge a situation correctly with almost no effort. Dr House confidant and sounding board is Dr James Wilson.